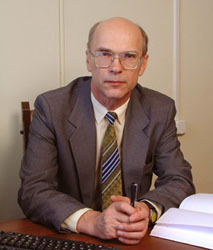 The head of the laboratory is Baidakov Vladimir Georgievich, Doctor of Physics and Mathematics, a laureate of the RF State Prize, the author of four monographs and more than 230 scientific papers. The laboratory of power and cryogenics was organized in 1989 as a result of joining the group of cryogenics of the laboratory of phase transitions and nonequilibrium processes (headed by Dr. of Physics and Mathematics V.G.Baidakov) and the laboratory of power (headed by the candidate of technology E.V.Volkov). Laboratory staff: 12 persons, including three Doctors, four candidates of Physics and Mathematics, three research associates, one engineer, one laboratory assistant. Development of methods for describing surface phenomena in small systems and thermodynamic substance properties in metastable states. Thermophysical foundations of resource-saving technologies in power engineering. The workers of the laboratory pioneered in obtaining experimental data for limiting superheats and nucleation rate in cryogenic liquids (condensed inert gases, hydrogen and its isotopes, nitrogen, oxygen, components of natural gas) in a wide pressure range, including the vicinity of the critical point. The thermophysical properties (p, p, T-parameters, ultrasound velocity and absorption, heat capacity) of cryogenic liquids in the metastable (superheated) state have been investigated. Kinetic properties (viscosity, thermal conductivity) have been investigated in experiments on superheated organic liquids. The surface tension of cryogenic, low-boiling liquids and their solutions has been determined in a wide temperature range. A kinetic theory of boiling-up of superheated liquid solutions taking into account all the main factors that limit the growth of a vapor bubble has been suggested. The method of molecular dynamics has been first used for investigating the stability of metastable states (superheated and supercooled liquid, superheated crystal, supersaturated vapor) of a simple substance. The kinetics of spontaneous boiling-up of binary solutions of cryogenic liquids with total or partial solubility of components has been investigated by experiment. A complex investigation of heat transfer to emulsions with a low-boiling disperse phase has been made. A considerable extension of temperature intervals of bubble boiling has been establishedям. A new technique has been suggested for calculating the reliability of fuel and power saving for regions by integrated indices. The interactions of power and economy factors in evaluations of power safety have been investigated. Along with fundamental investigations the laboratory participates in work of practical significance. A complex of investigations has been performed on thermophysical provision of safety for systems of storage and transportation of great quantities of cryogenic liquids. The workers of the laboratory took part in the development of methods for calculating transition processes in systems of filling, liquefaction and gasification of cryogenic liquids (with “Kriogenmash”). Some work has been done on thermophysical provision of safety for cooling systems of large storehouses for liquefied natural gas (with Gas Research Institute). An installation for heating natural gas with heat from extractions of a steam turbine was brought into operation on Power Unit 9 (with a capacity of 210 MW) of the Verkhnetagilskaya GRES. The installation gave a decrease in the specific fuel rate of 1-1.2 g/kWh, improved considerably the conditions of its maintenance and reduced the quantity of fitting. An experimental gas-turbine expansive station for generating electric power was brought into operation at the Sredneuralsk GRES of the joint-stock company “Sverdlovenergo”. Its electric power is 11.5 MW. The station ensures a fuel economy of 25-30 thousand tons of equivalent fuel a year. The main indices of power safety for the Sverdlovsk region have been determined by evaluating the interactions of power and economy factors in the region.